It is only fitting that Winchester should make a superior cartridge in the caliber that they trademarked. 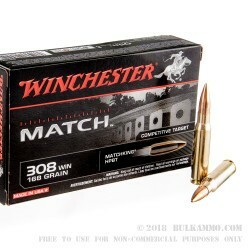 This match ammunition features Sierra’s MatchKing boat tail bullet, which is favored by competitive shooters for its heightened velocity, improved accuracy, relative immunity to cross winds, and design that prevents nicking and scratching during assembly. 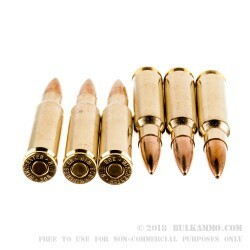 With a muzzle velocity of 2,680 fps, this relatively heavy 168 grain bullet transfers deadly energy upon impact. That damage is only accentuated by this bullet’s hollow point design, which will cause it to expand after penetrating your target in order to bring it down, fast. 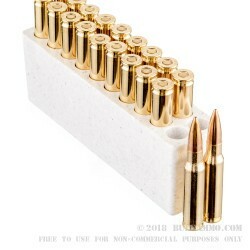 This cartridge also offers a non-corrosive Boxer primed nickel plated brass casing, ideal for handloading. 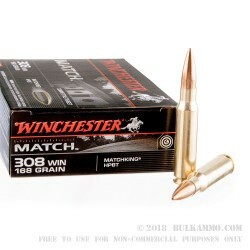 The Win 308 the most popular short action cartridge for hunting big game. This offering by Winchester, which has been renowned for the quality of their firearms and ammunition for well over a century, is designed specifically for deer hunting and delivers velocity, accuracy, and damage that you can depend on.